This is an old Lugbara saying which warns people against being predictable. A long time ago, so the story goes, a young kob would at the end of each day return to a favourite pasture, which it would eat for pleasure after the day’s grazing. An old lion, which could no longer run very fast wanted to eat the plump kob but knew it could not match it for speed. It kept observing the young kob and, having established that the kob would visit the same pasture every evening, went to lie in wait one day. 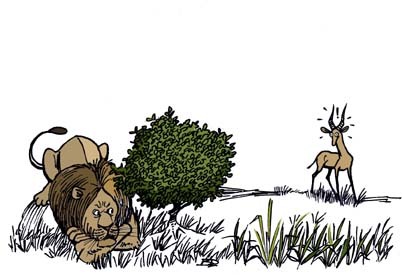 As the young kob tripped daintily to its favourite sweet grass, the lion sprang, caught the kob and turned it into a delicious meal. The Kob that visits the same grazing ground each evening risks death. To escape the fate of the young kob, this is a story of tolerance and hope, of change and imagination. In saying this, many are encouraged by the great institutional and structural changes that took place in the 1990s and the recognition that Uganda must be governed according to the law. The Judiciary, Parliament, the armed forces and the media, which gained freedom from the Executive during the 1990s, are more independent. These achievements, plus international backing, support an orderly and democratic preparation for elections in 2006. With Uganda’s strong economy and increased investments, there are too many gains no one wants to lose. By the beginning of 2005, even the persistent conflict in the North begins to subside as foreign support for the rebels begins to dry up and hard negotiations begin yielding fruit. Gradually an uneasy peace takes hold in the north. The date of the 2006 elections is announced well in advance and the necessary constitutional and administrative measures are put in place for the smooth transfer of power. The government establishes a strong and independent Electoral Commission which includes opposition members. The subsequent elections are peaceful, and are decreed ‘free and fair’ by regional and international observers. A new president is elected with a 60% majority, an outcome accepted as the people’s choice by both contestants and voters. The election observers praise the outgoing government for ensuring fairness, as the plump kob slips away from danger to live another day. The new government, seeking national unity, reaches across party lines for support and includes many strong personalities who criticised the previous regime. Now they are being held to the standards they demanded of the previous government. The new government continues good diplomatic relationships with the richer countries that offer aid and assistance. Decentralization, poverty eradication and social development programmes continue, as does the professionalisation of the army, the judiciary and the police, three institutions critical to the nation’s stability. On the whole, the new government’s first term is marked by goodwill and the desire to see Uganda succeed. Universal Primary Education (UPE) takes off, giving many more Ugandans access to education and greater confidence in government itself. In a search for jobs, the new president continues to encourage a culture of export and works hard to find markets abroad for our products, skillfully exploiting opportunities like AGOA in return for increasing backing of American foreign policy. But this is not enough. More jobs are needed, but where can they be found? The government tries measures to strengthen the rural economy by creating markets for food and cash crops. Regulations are streamlined, essential infrastructure improved. But many are still struggling as soil fertility declines and the cost of fertilizers rise. More people drift into towns, but there is little work to be found. What can be done? The lack of jobs causes people to believe that corruption and nepotism are ruining their own opportunities. The sweet grass of violent opposition and rebellion tempts many, but the population, tired of this talk and fearful of war, does not support such whining. No one goes to the bush. Instead of war, people opt to fight in local meetings and the media. Shame and exposure are used to limit corruption at all levels of government. Fearful of losing its mandate, the new government accommodates these critics and even expropriates the ill-gotten gains of the most corrupt. Northerners are particularly critical, but government convinces the remaining rebels of the North to accept large measures of real autonomy and creates a new cabinet level post for restoring confidence in the North. But ethnicity and regional imbalance still remain as dangerous sources of disunity and conflict, a chronic hindrance to development. Borrowing ideas from the successful campaign against HIV/AIDS, the ethnicity problem is publicized and debate is encouraged. Activists of all kinds test the use of new dialogues in workshops, seminars, schools and villages. A respected department in the President’s office whose watchword is “tolerance and respect for each other” supports them. People are encouraged to tell their stories so that everyone can understand what caused the damages of the past, often helped by writers, artists and musicians to express the hard pains they endured. Truth, it is argued, is the only thing that can set us free. In Northern Uganda, people begin to recover from the trauma and poverty of the long war. In this process of healing, new creative skills grow in society and the arts. As the records of the past become clear, people seek new ways to avoid similar violence happening again. They work together problem by problem, village by village, neighbourhood by neighbourhood. Honest differences are accepted honestly and lead to more peaceful ways of resolving hard questions. These very local movements reinforce national political skill, encouraging a vibrant parliament and independent judiciary to flourish. The young kob is learning to avoid the dangerous pastures where lions of division lie in wait. By this time, and following the settlement agreement with the North, much of the sting has been taken out of ethnic differences. After long and laborious negotiations, in public and private, the government agrees that the cabinet must adequately represent all the regions. Regional leaders are put in charge of their own local development, but forced to move around regularly to gather and share new ideas. Little by little, the success achieved in this area shows real gains, as energy, imagination and friendship grow, project by project. Habits of trust deepen and prove useful when people are faced with exceptional challenges. 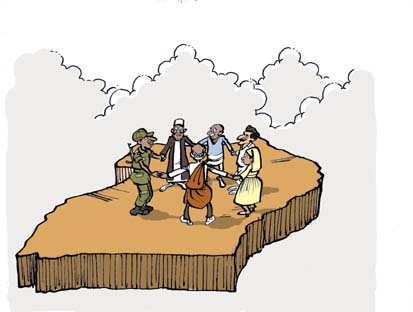 The second decade of the century finds a more sober Uganda facing a tough future. Freedom and political stability are not enough unless more jobs can be found for the rising generations. The professional generation that grew up during the civil wars is more confident as peace prevails. They use the government to test a new ideal of modernization in which environmental protection creates wealth and employment. They believe that with growing environmental alarm in the north, Uganda’s biological wealth should be translated into jobs and income for Uganda’s people. The first requirement, though, is to strengthen the laws curbing exploitation of Uganda’s forests, wetlands and soils. Educational programmes are redesigned to include much more environmental knowledge and older rural people are recruited as teachers. Finally, imaginative efforts are made to develop new markets for organic crops and the protection of habitats with high biodiversity, all with the aim of creating new incomes for rural peoples. One of the important contributors to this economic revolution is the 1990s LC system which gave localities responsibility for environmental protection. Year by year, local people and their local governments have been learning to strengthen the health and resilience of local ecosystems, while building their own political confidence and skills. 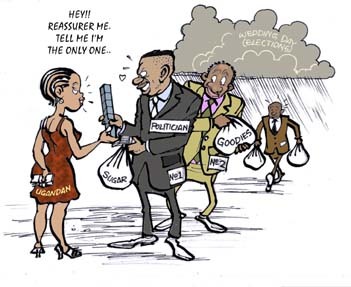 In 2010, despite pressure from the donors, the government creates a new department of biological rights, demanding and receiving payments from any firm seeking to exploit Uganda's biological wealth and the customary knowledge of Ugandans. Incentives are put in place to encourage people to switch from charcoal to paraffin for cooking. This reduces dependency on trees for domestic fuel and protects the watersheds of Uganda, as required by the newly renegotiated Nile River treaty. Even as the environmentalists praise Uganda, but many peasants still find life quite hard and are not persuaded that any wealth can be found here. In another move that strengthens the rural economy, both public and private efforts to create active markets for food and cash crops begin to pay off, both in the cities and abroad. Critical to the success of these markets are regulations, cheap mobile telephony and monitoring systems that ensure farmers know market prices and are paid well for their produce. The media and village leaders educate their people on better farming practices and their rights to good pay for their produce, while informal extension services further spread best practice skills. Little by little, life in Ugandan villages improves. By 2015, Uganda is becoming a better place but new demands start to emerge. None of the government’s activities are cheap and over time there is a rising expectation that services will improve. Taxes are raised, but the government cannot borrow much more and faces a growing debt burden. Caught between rising demands at home and the expectation of debt repayment abroad, the government is trapped. This time, sensing it would be a popular move; the politicians begin moves to repudiate the international debt, but the final decision is an East African affair. Active cooperation on issues of governance and economics in the region has led to the shared realization that large debts are holding everyone back. In 2015, the East African Community takes a stand and foreign institutions are forced to write off huge loans. Unfortunately, this financial declaration of independence is mistrusted by many Ugandans who fear it is a new trick to keep the government in power, despite having come to the end of its second term. As the 2016 elections approach, people see signs of a government unwilling to step down. Rumours spread about a return to the bush, but opposition leaders remind members of the government of their own strong stand in 2006 against lifting the two-term limit. Wary of popular unrest, the government has no option but to keep its promise. The 2016 elections bring in a new regime and the old lion of violent opposition slinks away. Why go to the bush to fight useless wars when the political system allows for a peaceful transfer of power? 2021 is an important turning point in Uganda's politics, as a new generation comes to power. Unlike the old breed of politicians who were more concerned about their ethnic, religious and political divisions, these leaders have new preoccupations. Dissatisfied with old models of development, they keep testing imaginative ways for their country to prosper and survive. They have the courage of their intelligence and the confidence of their own experience. They work with their East African allies to change unfair agreements and with their own citizens to challenge the ghosts of Uganda’s past. They see the great potential of the country’s diversity and the value of tolerance and dialogue. With these assets, a genuine transformation of Uganda has begun. Many are still struggling as Uganda feels its way into the future, but many more have confidence they can find new ways to create prosperous lives in a healthy and peaceful land.